When we look at an average class of diving students, they are still predominantly male. This is no surprise as surveys of people identify the misperception that diving is a male activity. This probably stems from the military origins of diving and the fact that in those early days, training was designed to pass the fit and fail the less fit. Then there was real stress in learning to dive and many women, sensibly, did not enjoy the idea of being stressed learning something that was supposed to be enjoyable. Now the PADI Open Water course allows a relaxed and fun way to learn to scuba dive. Anyone can do it without needing to be an Olympic swimmer. Diving is now one activity where both men and women are equal in the water. Manufacturers now recognize that their product must be comfortable for women and as a result equipment is lighter, more form hugging and more colour coordinated than before. We used to see the male Peacock on the skifields in the season’s colours – but most dive gear was black. For several years now we have seen that same colour consciousness among divers. There is no doubt that if we look good, we feel good. The rest is up to training. Dry suits mean that women-less winters of diving are over. In the more temperate waters, such as in New Zealand, more women are diving year-round because of drysuits. When many of the older divers started off in this fascinating recreational activity, women in diving were a rarity. In those days the focus in New Zealand at least, was chasing crayfish. Socializing was definitely of a robust nature and often the dive sites were on the edge. Training was on the edge also but with the changes brought about by PADI, and then by other training systems, learning to dive is now free of stress and is a total adventure. Apart from being the right thing to happen, recent years have seen the growth of interest in diving from women. This interest and participation has been a force for change in the way many men now dive and view diving. Now the emphasis is more on seeing rather than taking. A less “extreme” approach is taken to diving. This can be seen in the way interest in specialties has shifted. Although specialties such as deep and cavern are still popular choices, there has been an increased interest towards specialties such as: photography, videography, naturalist and wreck. Underwater hunter is, by comparison, a dying specialty (no pun intended). Now wreck diving is not seen as such a “macho” activity, rather a chance to explore an artificial reef. 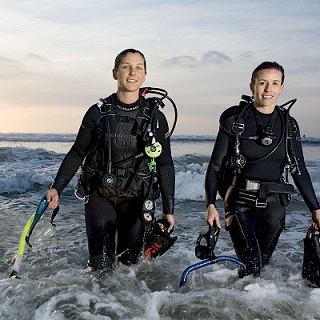 This new outlook on diving, and the influence of many more women diving professionals, means that the social life of divers is in balance as well. As a PADI Course Director who has been busy running IDCs since 1989, I have seen and encouraged the participation of women in recreational diving. I am glad to say that the percentage increase of women diving professionals is heartening. Gone are the days of the “ladies first” mentality. Now everyone races for the door to get their tanks out. Men and women alike help each other in and out of the water. Worldwide there are over 6200 PADI dive centres and resorts and more than 136,000 individual PADI Professionals who have issued more than 23 million certifications around the world. The opportunities are endless. A PADI professional qualification is more transportable than a university degree. If you want to travel, diving is the way to do it. Just follow the sun – and go teach diving. Worldwide there is a need for many more women Divemasters, Assistant Instructors and Instructors. As an employer, I welcome any woman who wants to make diving a career and am proud that we are more in balance in that regard than many of our local dive stores. Being able to offer an all female course with a female instructor is something every dive centre should be able to do – but often can’t. I am sure that most of the overseas dive centres and resorts are similarly short of women in diving. So I set the challenge to dive stores – hire women as dive professionals, not on the basis of gender, but on need. To women – I challenge you to recognize the potential of a career as a diving professional, and just do it. The need for women in diving is here now!